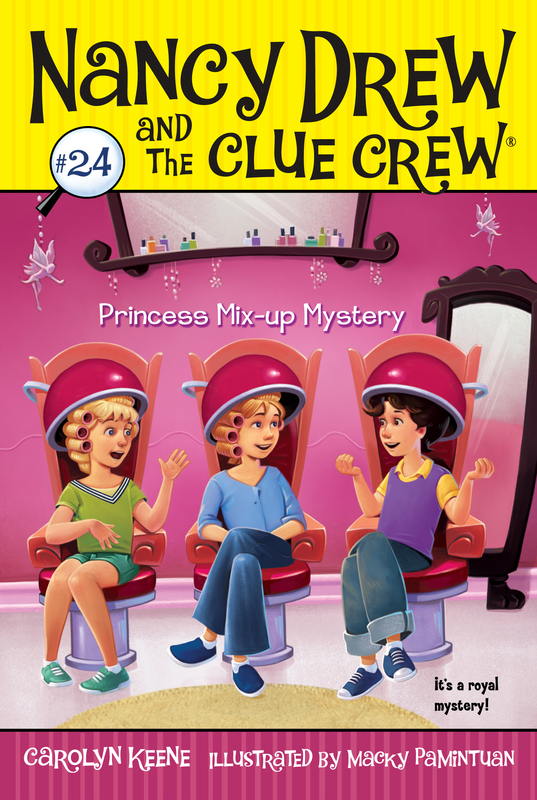 In Princess Mix-up Mystery, Nancy Drew and her friends must uncover a stinky plot at the local princess makeover beauty parlor. Who switched out the delicious-smelling Strawberry Spritz spray for one that smells like rotten eggs and turns the girls’ hair blue? “When I’m not thinking about printers, scanners, and speakers!” George answered with a grin. Bess rolled her eyes. “Are you sure you’re my cousin?” She sighed. River Street was the busiest street in River Heights. Besides the usual stores Nancy saw tiny green buds on the trees that lined the street. Not only was it spring break, it was the first week of spring—and spring was Nancy’s favorite season! “First stop,” Nancy said as they turned toward a store in the middle of the block, The Mean Bean Health Store. Nancy, Bess, and George filed through the door of the Mean Bean. There to greet them was Kevin Garcia. Kevin was in the girls’ third grade class at River Heights Elementary School. Kevin’s parents owned the Mean Bean, but he acted like he owned it himself. “Welcome to the Mean Bean, Clue Crew!” Kevin declared. Nancy smiled at the mention of their detective club, the Clue Crew. Everyone at school knew that she, Bess, and George loved solving mysteries. And were good at it too! “Hannah needs something stinky that will keep deer from nibbling her flower garden,” Nancy explained. “How about George’s sneakers?” Bess joked. “Ha, ha,” George said, not really laughing. Hannah Gruen had been the Drews’ housekeeper since Nancy was three years old. Not only was Hannah as sweet as her cupcakes—she was the next best thing to a mom! “Do you have the deer repellent?” Nancy asked. Nancy frowned. She didn’t want to disappoint Hannah, but the Mean Bean was the only natural store in town. Kevin’s voice trailed off as the girls headed down River Street. “Hannah will be so disappointed.” Nancy sighed. “But the deer—cartwheels!” George said, as they walked along. Prissy’s Princess Parlor wasn’t hard to find. It was the only store with a door decorated with purple and gold balloons. It was also the only store surrounded by reporters, photographers, and cheering girls. Prissy and Wendy Darling held opposite ends of a ribbon stretched in front of the door. Nancy noticed that the door was painted like a castle gate. “It’s just like a fairy tale,” Nancy breathed as the mayor ceremoniously snipped the ribbon in half. “Ogre?” Nancy asked. She looked up to see where George was pointing. Standing at the window above the store was an angry-looking man. His mouth was a grim line as he scowled down at the cheering crowd. “How do you know?” George asked. Nancy watched as Marvin slammed down the window with a bang. He didn’t look very relaxed to her! More cheers, as both sisters undraped a thick white mattress on the sidewalk. “Let’s all try to guess,” Bess said. “But you could be a princess!” Bess exclaimed. Nancy, Bess, and George hurried to the back of the line. A girl wearing a pink tiara was about to climb on the mattress when two bigger girls pushed in front of her. One began measuring the mattress with a measuring tape. The other listened to it with a doctor’s stethoscope! “Don’t those two go to our school?” Bess asked. Suki and Ella worked until Mayor Strong stepped in. “Girls, even princesses have to wait their turn,” he said. Suki and Ella grumbled as they trudged to the back of the line. But the moment they saw Nancy, Bess, and George their jaws dropped. “We didn’t see you when we got here,” Nancy said. Nancy could hear Suki and Ella grumbling as they slipped behind her and her friends. She tried to ignore the Rad Scientists as she turned back to the contest. Every girl so far had guessed the wrong number of peas. Finally it was Bess’s turn. She hopped on the mattress and lay on her back. “A good guess, but wrong,” Mayor Strong said. Next was Nancy’s turn. She climbed on the mattress, laid back, and stared at sky as she took a guess. “But not under this mattress,” Mayor Strong replied. Nancy’s heart sank as she scooted off the mattress to join her friends. She and Bess had no chance of winning the princess makeover now. Unless ? “Looks like someone already did,” Bess said. She pointed to a bill crumpled on the middle of the mattress. “Guess, guess!” the crowd chanted. George rolled her eyes and flopped on her back. Mayor Strong blasted the trumpet so loud it made George bounce. Photographers snapped George’s picture as she sat up, stunned.